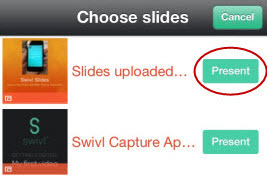 Instructions on how to upload slides to Swivl Cloud for use in your lecture recording and how to navigate through slides during a lecture. 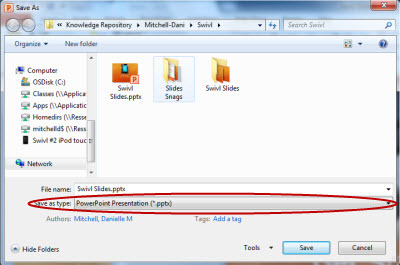 Step 1:Create your presentation in PowerPoint. 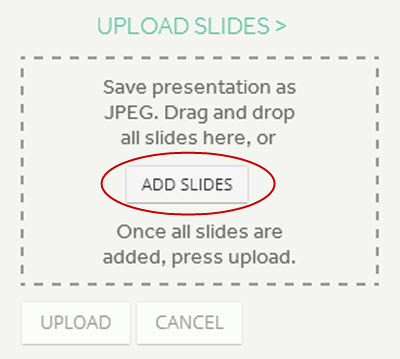 Step 2:Click File and Save As once your presentation is finished. 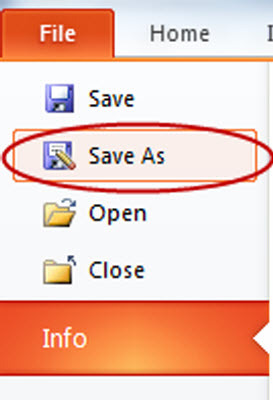 Step 3:Find and click the Save as type: drop down menu. 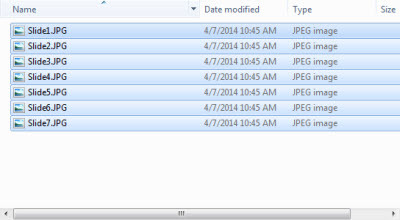 Step 4:Change the file type by clicking Jpeg File Interchange Format (*.jpg). Step 5:A popup will appear that asks "Do you want to export every slide in the presentation or only the current slide?". Click Every Slide. 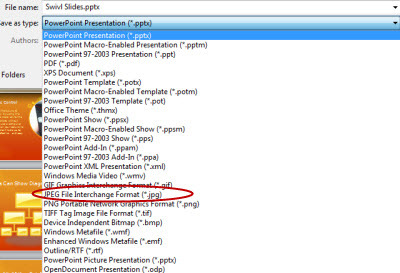 Step 6:Another popup will appear, stating "Each slide in your presentation has been save as a separate file in the folder \\Applications:yourfilenamehere/presentationname.jpg" Click Ok. Your presentation is now ready for upload. 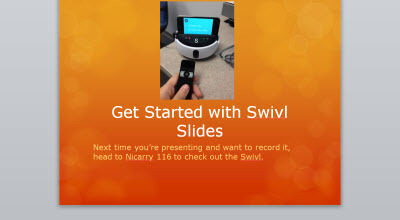 Step 1:Log in to your Swivl Cloud account. If you do not have one, sign up for one here. 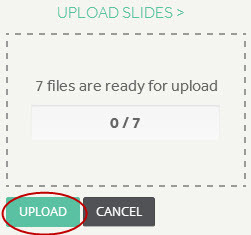 Step 2:From the homepage, click the Upload Slides button. Step 3:A box will appear. Click ADD SLIDES. Step 4:Locate the slides for your presentation. Note: Remember each slide of your presentation was saved as an individual .jpg file. Step 5:Select all the slides and click Open. Step 6: Click Upload once you return to the browser. 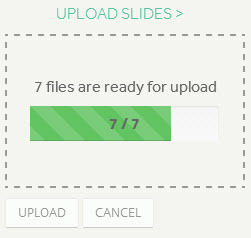 A progress bar will show how many slides have been uploaded. Step 7:A pop up will appear with boxes for a Title and Description of the slides. 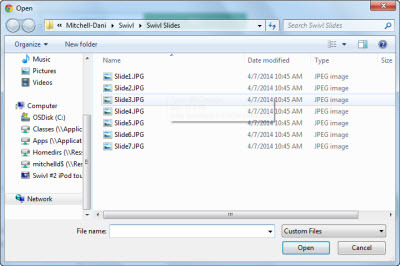 It will automatically be labeled "Slides uploaded on 00-00-00" with the date. Once you have filled out the fields, click SAVE. Note: It is suggested you title the slides with the same title as the presentation for easy retrieval later. 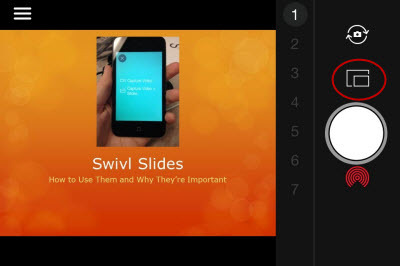 Step 8:Your slides have been uploaded and will automatically be added to the slide library on your app as long as the iOS Device is connected to wifi. 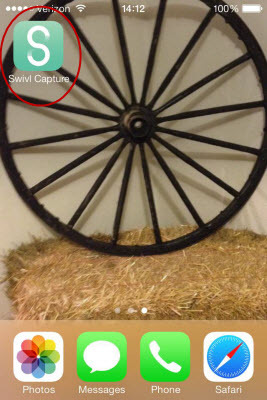 Step 1:Open the Swivl app. 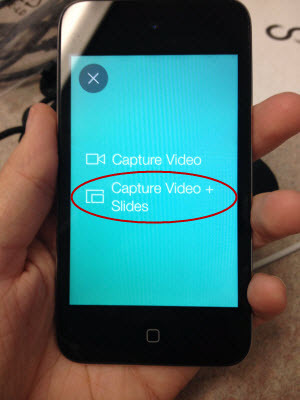 Step 2:Click Capture Video + Slides. Step 3:Find your slides and click Present. Step 4:You are now ready to record. 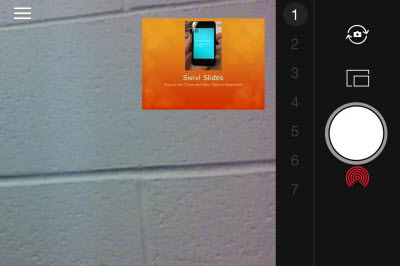 Step 1:Click the picture-in-picture button if you would like to see both yourself and the slide. 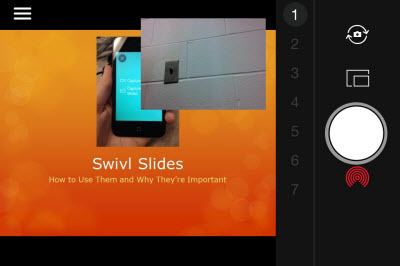 Step 2:The screen will now show video of you in the top right corner of the slide screen. Step 3:Click on the video of you to swap the screens. This will reverse the sizing, making the video of you the larger screen and the slide the smaller. 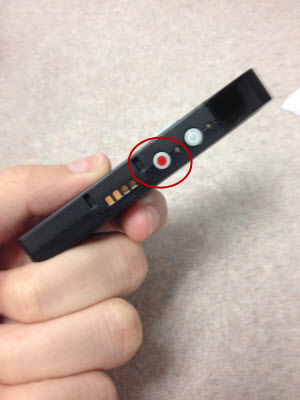 Step 4:Click the record button on the side of the marker. Note: You must have the Swivl set up correctly and be connected via bluetooth to continue. Please see Setup for information if you are not currently set up. 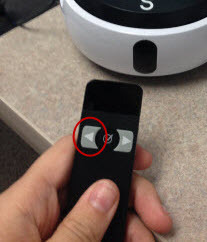 Step 5:Once you are recording, advance to the next slide by pushing the right arrow on the marker. Step 6:Push the left arrow on the marker to return to the previous slide. Step 7:Push the record button on the marker again to finish your recording. The recording will now be available to upload for sharing. 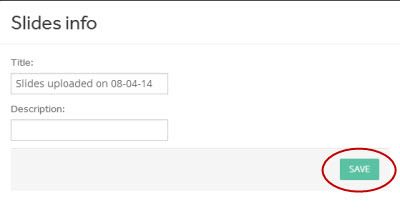 See Upload Recordings for information on how to upload your video.